The loft Unit is incredibly spacious, with a soaring 24 foot ceiling to capture the sea breezes and double arched doors leading out to the dining balcony for an incredible ocean view. When the Swell is Up, Apple Bay offers some of the area’s best surfing, boogie boarding, and body surfing all conveniently located just outside the villa. Of course one of the most popular activities is simply reading a book on the water edge porch while soaking in a few rays of sunshine. 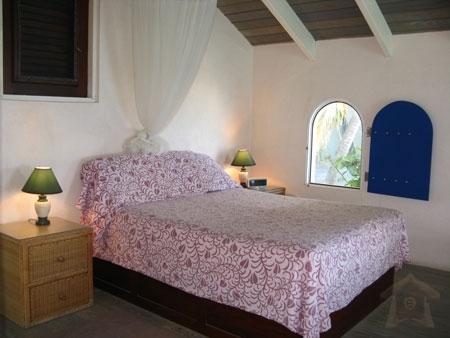 The Casa Caribe Loft is simple, clean, comfortable and fully equipped. The Loft features twin sleeper sofas can be used to accommodate those with young children. the \"loft\' area is the master bedroom and offers a queen size bed with an open and airy walk-in closet. The Loft features free WIFI for your computer. We provide a Cell Phone with a local BVI number for easy communication. You can call long distance too. We provide a five dollar credit on your phone. Local calls are .17 per minute. You can purchase more minutes for the phone at nearby locations on island. The outside of this unique villa features a porch/patio directly with fresh sea breezes and an uninterrupted panoramic view spanning the northern islands. The Loft features an i-pod stereo system on which to enjoy your favorite music or use audio cassettes or CD\'s. The Kitchen featuring an electric stove, microwave, refrigerator, toaster, blender outdoor gas barbecue grill, beach chairs and all paper goods.